Frank has over 50 years experience in private legal practice in Sydney. He merged his practice of Windeyer Dibbs with that of Atkinson Vinden in 2004 and continues working 3 days a week with Atkinson Vinden. He has experience in a wide range of areas, acting for clients ranging from individuals to small businesses, corporations and local councils. 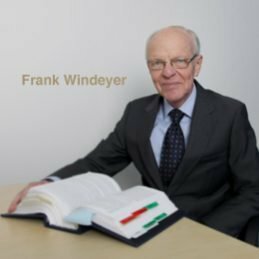 Currently, Frank mainly practises in estate planning, wills, powers of attorney and guardianships and in the management of deceased estates. Frank enjoys gardening and art, occasionally dabbling in painting. He is a member (including Past President) of Rotary Club of Lindfield, President of Easy Care Gardening, a volunteer based not for profit organisation of several hundred volunteers assisting older people in their own homes; a past member of the Army Reserve attaining the rank of Lieutenant Colonel, awarded Reserve Forces Decoration (RFD) and a past Leader in the Scout Association for nearly 30 years. Frank is married with 2 adult children and 2 grandchildren. I would like to thank you for the highly professional service you provided over the last three years in dealing with mum and dad’s estates. Not only was I impressed by your professionalism but also by your kindness and empathy.